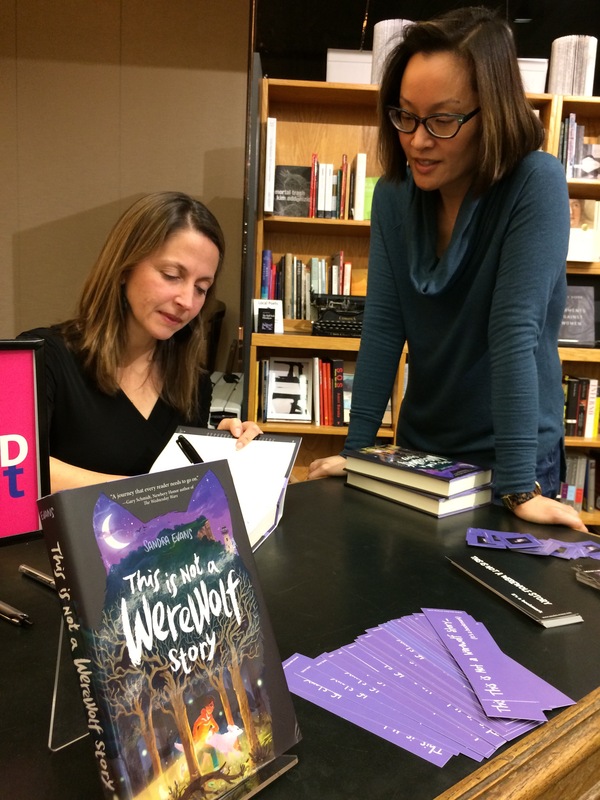 Sandra Evans signs “This is Not a Werewolf Story” for me at the University Bookstore, Nov 2016. I’ve been a professional adviser for the last 16 years but it isn’t very often that I’m asked to give advice to my 15-year-old self. But that’s exactly what my friend, the amazing author Sandra Evans, asked me to do this month. I met Sandy through our mutual friend Tamiko Nimura, a terrific writer and people connector. When Tamiko introduced us over email, I immediately bought a copy of Sandy’s debut middle-grade novel, This Is Not a Werewolf Story. After reading this beautiful, magical, yet also realistic story, I knew I had to meet her. I’m always a little unsure when I meet a fellow writer–will they be as cool as their writing? Or shy? Or morose? Or not like their writing at all? Lucky for me, Sandy was just as fun, whimsical, and fascinating as her novel, and we had a great time talking about writing, the writing life, and everything else under the sun. So, when Sandy decided to start a series of interviews with authors and creatives on her blog and asked me to be the first interview, I agreed. It was both hard and easy to think back and remember my younger self and what she thought about certain things. And though some of the memories made me sad, some also made me smile, and in the end, taking this walk down memory lane was very gratifying. Hope you enjoy it. If you do, please post your comments below. Thanks! ps. This post contains an affiliate link. If you make a purchase via this link, I will be paid a commission at no cost to you, and you will be helping me devote more time to writing books. Thank you! Love this!!! ‘LISTEN TO YOURSELF MORE THAN YOU LISTEN TO OTHER PEOPLE’ Great interview! I think some parents of teens might disagree with me on my advice. But, as an adult looking back, I think that many teens KNOW what’s right for themselves, they just are struggling with too many expectations and judgments from too many people. It clouds their thinking. I know it did for me. Peg: I loved reading your interview with Sandy! So much richness there. You are a woman of many layers. It was cool to know more about the genesis of “Contenders” and also your long personal history with writing and art. I’m so inspired by the way you follow your passions and instincts and that you’re now doing your favorite job as a writer/blogging/writing coach! I didn’t see a place to leave a comment on Sandy’s site, so I’m commenting here. I haven’t delved in art for a long time. It was my first love, but writing takes up so much of my creative strength now that there’s not much creative brain power left for other pursuits. But, just this weekend, I realized that I can add a bit of art back into my life. I’m going to start making small, simple drawings of animals again, like I did when I was a kid. I hope to have created a small collection in a month if I draw one or two every day. Wish me luck. I thought there was a way to comment on Sandy’s site but I guess there isn’t. Thanks for taking the time to comment here. I’ll take that suggestion about commenting on her site off the end of my post. Really enjoyed the interview–Sandra had good questions. It sent me through the gallery of ancient crushes…where the Mona Lisa hangs next to The Scream. I like your advice to your 15 year-old Peg: “Listen to yourself more than others.” It’s something that applies across the decades, but especially at an age where peer pressure is of tectonic intensity. Did you hear about that report on how depression is increasing in girls? It was an NPR story on a study of teen depression, and they found that for girls there was a spike in 2011, when some of the new social media tools debuted. One thing at a time, but I can see you going back to the youth fiction pond at some point. You have some valuable things to say, and an artful way of saying them. Glad you enjoyed our interview. Sandy sent me a lot of questions and I was allowed to just answer the ones I wanted to. I like that reading the interview made you wander down that primrose path of old crushes. It’s good not to linger there too long, I find. For me, there’s too much embarrassment and in this case, sadness. I am not surprised that depression is increasing in girls. Not surprised at all. I think boys will catch up fast, if they haven’t already. Just read an article about how there’s so much demand for mental health counseling at colleges that students now have to wait 2-3 weeks to get in to see someone. I’m definitely going to return to middle-grade fiction (sequel to The Contenders) after I finish SEVEN DUDES. I also have a YA series in mind for later. Thank you for the encouragement, Edgy! John Lennon is correct for 10 points. You’re pretty good–almost no one gets that right. Embarrassment and sadness indeed; my brief skip down that path reconnected me with a poem about a particularly wounding crush. But also how those kind of wounds can sometimes open you to something larger than your obsession. I like that you have book ideas orbiting like planes stacked up over SeaTac. May they land safely, and transport many readers! Some crushes are worse than others, that’s for sure. How great that despite the pain, you wrote a poem about it and transformed it into a piece of art. I’m hoping that you will soon share it with others (hint, hint, nudge, nudge…). I LOVE how your describe my book ideas: “orbiting like planes stacked up over SeaTac.” It sure feels like that. I need to get to landing those planes!